I tend to forget to mention that I am a Beekeeper. It’s become so natural to me and such a joy after wanting to keep Bees for so long, that I simply forget that not everyone knows this! When I worked it was a fantasy that would never materialise, how would I ever find the time and when would I start to research what was needed? It became one of those things that may have happened in an alternative life. When I suddenly had an alternative life, one of the things that helped me cope was letting go of what I could no longer do and try and think about how to do what I would like. With plenty of thinking time I was able to dip into Beekeeping blogs, and websites. I began to piece together what I’d need and who could help me. It was important that the Bees were in my garden as I wouldn’t be able to travel to visit them. I also couldn’t attend courses or meetings so I needed a mentor. 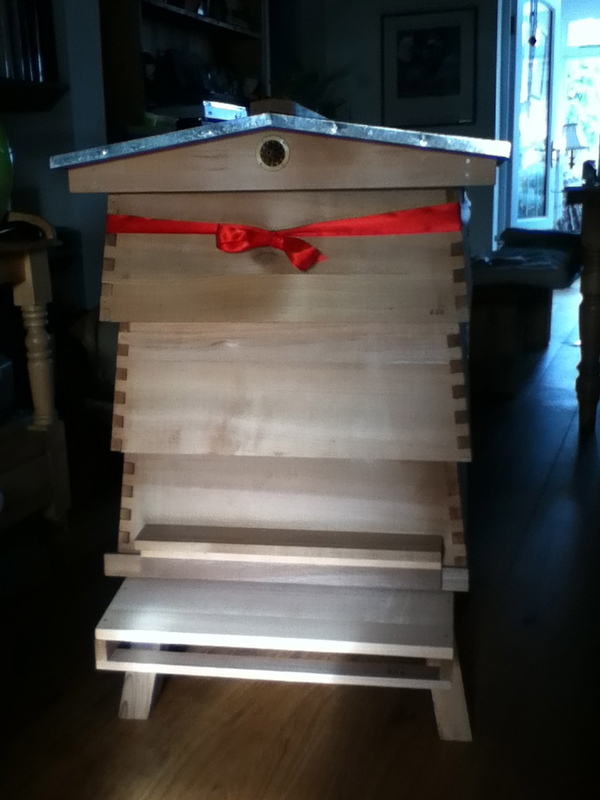 Three years ago Greg bought me a beautiful ‘WBC’ cedar wooden hive. It came as a flat pack and so he enjoyed secretly putting it together in time for my birthday. He was mystified as to why I would want a hive without any bees and also doubtful that anyone would be able to give me all the help I needed. I was very insistent though, I needed a hive and then everything else would fall into place. Of course, once I had my Hive everything did indeed fall into place. With a November Birthday I had time on my side to find a mentor. It so happened that we had that year completed an extension on our house, which meant that our back garden was now a pile of mud and rubble. The hedge had been taken out to allow for pipe work and so from my bed I now had a clear view into the adjoining field. Although it is a privately owned field there are a few locals who walk their dogs around it and I’d noticed a new chap and his dog. I’d searched the local Beekeeping websites and thought I’d start with contacting the local ‘swarm collector’ as he’d either know where I could get Bees from or may have a ‘spare’ swarm over the coming months. It turned out that the swarm collector also happened to be the producer of the local honey I bought, and when he asked where I lived, he knew exactly where we were as he’d juststarted walking his dog around the field! Chris ‘Bees’ was my perfect contact. Not only was he the swarm collector, he kept his own Bees, around 10 hives in various orchards and gardens near our town. He had also spotted our mini orchard and had thought what a perfect spot for Bees. Now I’m enjoying my first summer in charge of my own Bees. Chris handed over the reigns last Autumn after we collected a magnificent 140 pounds of honey using four supers on my single hive. I’m wanting to keep my bees as naturally as possible and so I am experimenting a little with various techniques in Bee management and care. I’ve started to keep a ‘Bee diary’ so I’ll be updating my findings and observations over the coming months. This is something my husband wants to do! Isn’t it wonderful the new discoveries we make as a result of our “alternative” lifestyle which becomes “the” lifestyle! It is wonderful Pepper, and then I feel a teeny bit guilty when I say I wouldn’t change my life and go back to my ‘healthy’ days. Do go for it Pepper, my husband has just got interested this year, which is very lucky for me. A ‘normal’ person can manage one hive easily. It takes about an hour a week/ ten days. This year i’ve been leaving them a bit longer as so far they seem quite happy!